Belvidere will once again host an Annual Antique Car Show, a fundraiser benefiting Belvidere Heritage. On Saturday September 8th and Sunday September 9th, guests will be dazzled by the automobile magic of yesteryear. 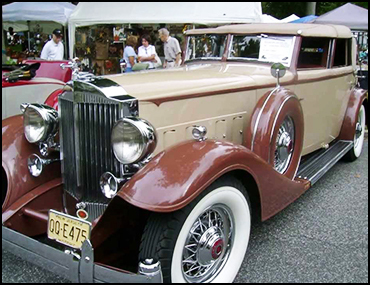 The 31st Annual Antique Car Show will be conveniently held in the center of Belvidere around Garret D. Wall Park. With free access to the show, 50+ vendors, live entertainment, demonstrations and lots of Victorian flair, it will certainly be a memorable event. We ask that guests respect the vehicles and refrain from touching them without the owner's permission. Owners of vintage and classic cars, and even some more modern beauties, are welcome to register and showcase their vehicles. You can register early by downloading the registration form and submitting it with your registration fee, or you can register the day of the event. There aren't any requirements for car make, model or year; we simply ask that registered vehicles be in a condition of preservation or restoration that would reflect favorably on the show and hobby. Special prizes and dash plaques will be awarded. At this year's Victorian Days you will have the opportunity to view many antique and classic vehicles. Although pre-registration for the car show has ended, there are still spaces available. Please visit our TICKET TENT during Victorian Days to register your entry for $15 per vehicle.